Targus is known for making great bags, and the Targus Spruce EcoSmart Backpack does not fall short! The Targus Spruce Backpack is part of Targus’ EcoSmart backpack line. The EcoSmart line is made entirely of recycled plastic bottles. Not only does it have many different pockets, all of them have great depth. The back panel is cushioned so it absorbs shock and allows for a more comfortable fit. The Spruce backpack shows the green stitchings which set the backpack apart from others — a techie fashion statement, if you will. Also, it has three circle-shaped designs which add to the backpack’s style. Green is a major theme, no doubt, since green is an “eco-friendly” color. The colors give the backpack a sleek yet sophisticated look that anyone would love. The Spruce backpack has the standard two pen loops, zippered pouch, and a key clip. Additionally, it contains a business card holder, so you can always give your business cards out. In the other two main compartments are a large area for books, notebooks, or whatever you would like to fit in. In the second compartment, there is a laptop compartment and another area where you can add a few more books or notebooks. The laptop compartment is such that a 15 inch MacBook Pro fits snuggly, so it’s more likely to accommodate smaller laptops. The Spruce backpack also has a pocket on the outside, so you are able to put something into your backpack quickly. Everyone knows that comfortable straps on a backpack are nice and, fortunately, the Spruce backpack has that in spades. There are many straps which allow you to get a personalized custom fit. When you put the Spruce backpack on, you are greeted by the comfortable straps. The right hand strap is equipped with a headphone holder, so you can wrap up our headphones when you are not using them. Also, the back panel is cushioned, so it absorbs some shock, and helps keep your laptop and other items safe. The Spruce EcoSmart Backpack is not as comfortable as backpacks such as Swiss, but it does a pretty good job. Though they pull gracefully but, the zippers on the Spruce backpack are solid so, unlike some backpacks, you do not need to worry about accidentally pulling them off. The Spruce EcoSmart backpack sports a water bottle holder and a MP3 player holder. The water bottle holder fits any regular sized bottle and you can even get a canteen to be even more eco friendly. A neat feature about the Spruce EcoSmart backpack is the MP3 player holder. While you’re walking across campus or walking to the coffee shop, you can plug in your MP3 player, feed the headphones through, and your ready to rock and roll. Also, when you’re done listening to your music, you can coil the headphones wires around the right hand strap and unwrap the headphones when you want to listen again. If your looking for a durable, stylish, usable laptop backpack that will not break the bank, the Targus Spruce EcoSmart Backpack is definitely a contender. In my opinion, this backpack would be perfect for a college student who does not carry too many books, though it can fit a respective amount, and who needs to carry his laptop around. I enjoyed reviewing the Targus Spruce EcoSmart Backpack and I look forward to see what else Targus releases in its EcoSmart line. 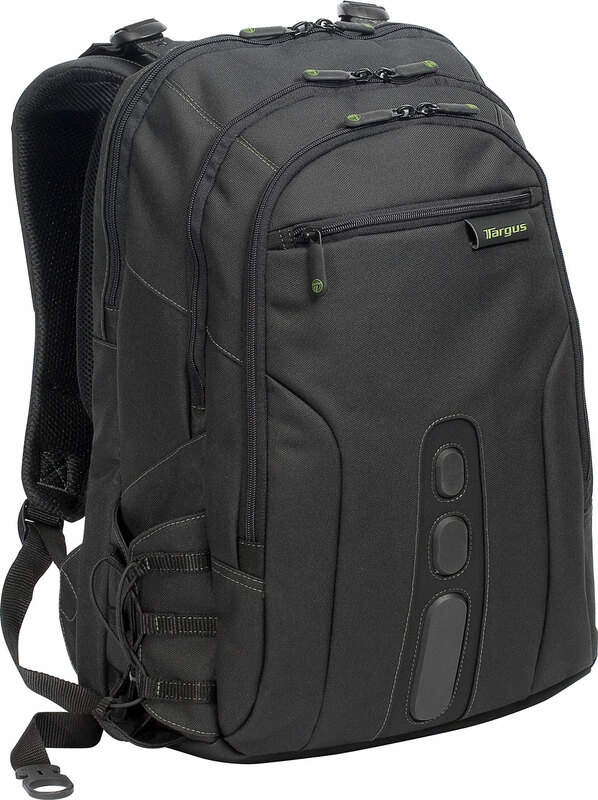 If you are curious, take a peek at the Targus Spruce EcoSmart Backpack here. Tell us your experience with the Spruce! Leave a comment.